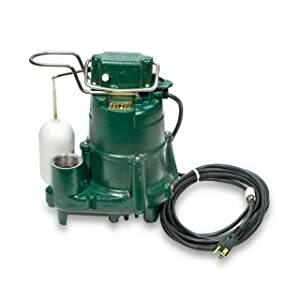 The Zoeller M98 Flow Mate Automatic Cast iron Submersible pump is an automatic cast iron submersible sump pump that offers trouble free and reliable operation. It has a cast iron casing coated with an epoxy powder finish to protect it from corrosion. It does not have any sheet metal parts but the guard, handle, and all the screws are made from stainless steel. It is equipped with a thermally protected, split capacitor motor. Zoeller 98 is a solidly built, robust dewatering high capacity pump that takes no time to pump out all the water in the sump well. It has the capacity to pump 3420 gallons per hour to a 5 ft head. It is equipped with a float that activates the mechanical switch. It has a clog resistant design that makes it capable to pass solids that are ½’ in diameter. This sump pump is gentle enough for all those residential applications, and has enough power loaded in it to take care of heavy-duty pumping work in all those commercial fountains etc. The Zoeller M98 Flow-Mate Automatic submersible pump is made with cast iron casing that is coated with an epoxy finish to protect against corrosion. Also, the motor is protected from overheating by being permanently oil-filled and hermetically sealed. The sump pump has an opening 1.5 inches wide which takes a male adapter. Screw in the PVC pipe with the male adapter and connect the rest of the pipe. Voila. You have installed it. There are no sheet metal parts, which means that most of the parts and screws are protected from corrosion. This pump has been constructed to be as submersible as possible with every part constructed to withstand the damage that comes with being under water so you can expect it to last for a long time. There’s even a watertight neoprene ring between the motor and pump casing. Its maximum capacity is 3420 gallons per head to a 5ft head lift, which is considerably more than what you’d find in a conventional sump pump. It has a permanent split capacitor motor which runs at 115V. It has a maximum operating temperature of 130° F but the motor is equipped with an automatic reset to protect it from thermal overload. It is designed not to clog. This pump can handle ½” circular solids without clogging. Another great aspect of this motor is that it is extremely quiet compared to other sump pumps in its category. You can barely hear it running even if you are just five feet away from it. Small bits of gravel, grit and sand pass through the pump without any problem, however if you have installed a discharge line with a fairly average head of say 5 feet, be sure that you check your check valve or discharge pipe as dense solid material may just hang up in the middle of the pipe or foul the valve. One buyer complained about the use of sleeve bearings for the main pump shaft and its potential impact on the durability of this pump. The unit is slightly on the heavier side so you might not be able to install it all alone. Besides these points there’s not much to say against the design and performance. It is a real work horse that will last through different dewatering applications without being damaged by corrosion or impact.